OKay, I may be wrong on this one, but Faust initially wanted Celestia to be a queen and not a princess, but Hasbro demanded Celestia to ba a princess. Also, if I'm not also mistaken, it was a Hasbro mandate to have another alicorn princess (aka Candence). I wouldn't be surprised if this was another hasbro mandate thing to sell new Twilight toys. what about her? she's an alicorn too, Kal. she doesn't nullify my point in any way. I was referring to the "status quo" of storytelling in general. In which context, cliche and status quo are on opposite ends of the spectrum, with "original" or "well-executed" ideas being the desired, central point. This could add to the show by having more epic adventures in season 4 happen because of it. How so? The main six have already battled everything from timber wolves to an ancient god of chaos. What extra leverage could Twilight being an alicorn possibly give them in having "more epic" adventures? Edit: Also, according to M.A. 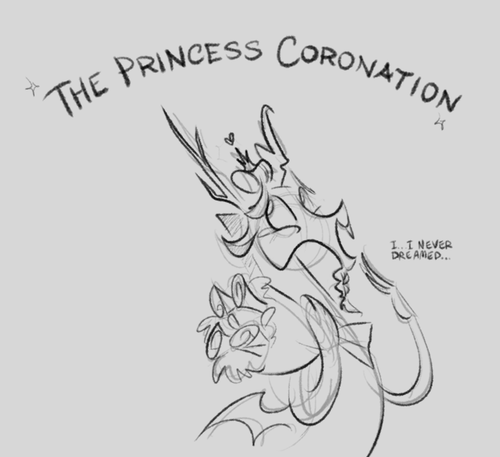 Larson's twitter, "Princess Coronation" isn't necessarily the actual title of the season finale. It may have just changed since the last time he saw it, but as far as he's aware, that's not the title. I was actually talking about more traveling style adventures like they would have to go from place to place as ambassadors or something since Twilight would now be a Princess. No. But it is the name of the big finale event on the hub, the same as the event for "A Canterlot Wedding" was called the "My Little Pony Royal Wedding"
So while it's not the episode title, it does kind of give away something of what it's about. Season 3 Finale Title and Synopses Reveled! Magical Mystery Cure "When Twilight casts a spell that switches the Cutie Marks and destinies, the only way to reverse the spell is by writing her own magic." I'm going to make a bold claim here that any Alicorn Twilight is going to be temporary, likely by way of getting Celestia's or Luna's Cutie Mark from the Spell. How any of this has to do with a Princess Coronation is anyone guess at this point. I think everyone can calm the heck down now and relax. That sounds like it will be an interesting episode. Not cliche or anything. I would love it if they pulled a Cliffhanger ending on us for the Finale, it would be very unexpected. However I know that isn't going to happen because its a little kids show and that would be a bit to much. The new episode was nice. Discord was awsome. Well, except for the ending which was downright forced, in my opinion. But I have to say that Discord's line 'Friendship is magic' made me chuchkle a little. I love how bronies are losing their minds and claiming Discord is ruined. Such manchildren, flipping out at a show that isn't really targeted at them. I don't think Discord has been ruined. That ending could have worked if it hadn't been so freaking rushed. Also, please be polite, dude. Eh, people will complain as they always have, so I could care less. Personally, I liked the episode, and people act like this should've been longer at lest, but as Foxstar said, people need to remeber this show was made for a pretty young age demographic. It's 22 minutes. Eveyone knows this ahead of time and save for season openers, it's always going to be 22 minutes. Why are people still having fits about stuff being 'rushed'? Every single half hour cartoon on the planet has the same rules they have to follow. And I am being polite, they are being manchildren. That's the polite way of saying it. The episode did get that rushed feeling, but it didn't seem to do anything that much wrong.Up until after the tea party in my opinion anyway. It also seems from the comments on Youtube that Fluttershy is way too gullible sometimes. Though i admit i found the ending extremely corny, but hey. At least Discord is free again. Maybe the Hub wanted to mess with us, so they named their event without even knowing the episode's plot. Yes, but most of those shows don't have plot elements like "the bad guy is now good," or if they do, they stretch it over 2 episodes. and we're not having fits, we're stating an opinion that, if it were possible, it would have been better with a few extra minutes. And I am being polite, they are being manchildren. That's the polite way of saying it. Actually the polite way is saying they're being "immature". Overall, I liked the episode. As stated, it could have done with a few more minutes but that isn't the show's fault. I'm pretty sure the big line was the "friendship is magic" line, or possibly when he said "most of the time" Either way, they overestimated how excited we'd get. I liked the episode! I also could relate to Fluttershy a lot. I also don't mind Discord's change. It's clear he's still a powerful trickster, so who cares if he isn't maniacally evil? This actually opens up the show to more options now that Discord can exist without the plot turning into "Discord is back and terrorizing everyone and needs to be stopped." I just finished watching this week's episode on youtube, and I rather liked it. Discord being sort-of good now was a nice change. Maybe they can use him as an ally against the really evil villains like the Changelings. I definitely felt sorry for him when he started tearing up at the idea of losing Fluttershy's friendship. And, it was fun to see Angel being terrorized! That was a good episode. Discord's change was pretty corny, but eh, I like corny. I'd be amused at a comic with them attempting this same thing with King Sombra, and it backfiring horrifically. Also, Foxstar, it seems like every time I get on here there's a post by you deriding some people or their reaction to something. It's very disheartening and there's no reason for it. What part of trying to condition good people by removing their virtues and then enslaving an entire city to his whims isn't evil? Adventure Time can throw great paced episodes in 11 minutes. as for one or t parters. There are plenty of shows (old and current) that have a LOT of two or three parters not being restricted to season openers or end. as for the polite part, I must say I chose the wrong words. I meant: don't be a jerk. Well He's probably closer to chaotic neutral. He only removed their virtues because they were going to spoil his chaos with the elements. he didn't exactly effect anypony but the mane 6 in that way. and some good came of it. Did you see how spry Granny Smith was? She had the dance moves of a much younger mare. Plus Discording the Mane 6 was part of the game that they agreed to play with him to get the Elements back. Changing who they were was just the lose condition for that particular game. He was just really having fun and they didn't have to agree to play (sure it would mean everything was chaotic forever but still he gave them the choice) so it wasn't really evil. As for the city (and the rest of the world) itself well that's just chaos, he didn't actual enslave anyone, like Sombra did, he just made everything Chaotic. Which isn't evil it just selfish because it doesn't take into account how everyone else will feel about it. Adventure Time isn't tied to a toyline like MLP is and Cartoon Network is not Hasbro. Different rules. As for being a jerk, no one on here has seen me be a jerk yet. Not even close. The forum rules preclude attacking or belittling other posters. Please do not call one another "jerks" or confront each other about potential rule violations. Instead, if you see a post that violates the forum rules, you are entirely welcome to report said post. Further, please keep in mind that everyone is allowed to state their opinion, assuming such is within the confines of the aforementioned rules. I'm not sure if I like what they did with Discord yet. He was my favorite villain ever (Like, of any villain from anything) because all he really wanted to do was cause chaos. He didn't want to hurt anyone, he didn't want to blow up the earth, he didn't want to capture a county and turn everyone into his slaves, he just basically wanted to have fun. To me, it seemed he could do anything he wanted as long as it wouldn't make sense in the normal word, thus pretty much limiting his power to whatever his imagination could think of. He could get the Elements of Harmony from the chamber that only Celestia herself could open because it "Didn't make sense." What other bad guy can do that? I personally would like to see another episode with him in season 4 before I pass final judgement, because he could still be really fun and his same "not take anything seriously" self that I love even though he's not "Evil" anymore. I had a hilarious idea for an MLP parody song, but I forgot it. Wait, I remember now. Rewrite this => http://www.youtube.com/watch?v=-xiAbDkXDgg to be about King Sombra. I'd buy it on i-tunes. New episode was better than I was anticipating from the previews they showed. As expected, there was no real way they could lump a convincing reformation into a single episode, so there's not much to complain about there; Polsky did about as well as one could expect given the time constraint. Discord's antics were quite entertaining throughout, and I feel like he was written fairly well, which was a concern when I saw the previews (which displayed, in my opinion, one of his weakest scenes in the episode). Only thing that made me really roll my eyes was the gratuitous title drop at the end of the episode. I'm also looking forward to seeing him in future episodes (next season, I suppose), assuming they don't lose sight of the fact he's still a trickster god even in his reformation to the "good side". I actually suspected they might do something like this for him (maybe it was closer to "hoping" than "suspecting", but meh) quite some time ago, so I can't say I'm disappointed with this episode. Probably not one I'll be watching again any time soon, but I certainly enjoyed it the first time through. Adding that to the list of "Comics I Need To Dub At Some Point". I'd totally write it (or try at least) if I had someone willing to sing it. The prophecy has come true! Welcome to the team, Discord! Last edited by Radio Blue Heart on Mon Jan 21, 2013 5:48 pm, edited 1 time in total. Um, think you could try that again? I can't see it. Edit: oh hey, I just had an idea! The synopsis says that Twilight accidentally changes cutie marks and destinies around, so maybe she gets Rainbow Dash's destiny and grows wings to fly really fast? Then it gets undone by the end? Refreshing the page worked for me; this is the pic he posted, though. On a completely unrelated note: I spent most of the evening I was supposed to be recording lines for an audioplay instead working on a cover of Obsolete by Mic and Lulz. Oops.